» Vegan MoFo #16: Amy Supreme Don’t Eat Off The Sidewalk! Once upon a time, Amy told me that she likes to put wing sauce on macaroni and cheese. I thought that was one of the most fabulous ideas i’d ever heard, so I tried it. AND IT WAS. Just a little drizzle of hot and slightly sweet wing sauce goes wonderfully on creamy, but usually kind of plain, macaroni and cheese. I call it Amy Deluxe. Well, I just took it to the next level. To the Supreme level! Make wing sauce (you really don’t need too much, I made about half a cup and it was way too much and I paid dearly for that). Make seitan or steam some tempeh and cut it up into bite sized pieces. 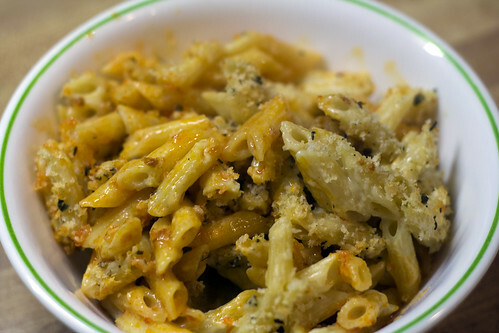 Make your favorite vegan macaroni and cheese recipe. Mix some bread crumbs with vegan margarine and a few herbs. Put the wing sauce in the bottom (according to Amy, purists put the sauce on the bottom) of a baking dish, add your seitan or tempeh, and toss to coat. 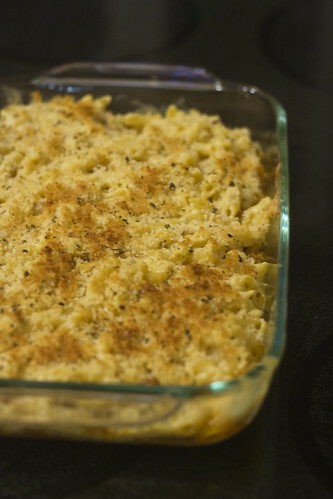 Spoon the macaroni and cheese on top, sprinkle with the bread crumbs, and bake at 350 degrees until the bread crumbs start to brown. Take very poorly lit pictures where you can’t even see said seitan. 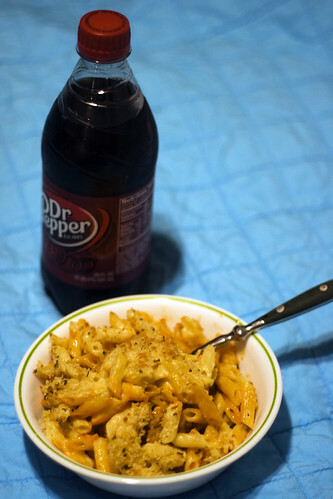 Crack open a Dr. Pepper and chow down!